We are living in an age of jitters. A bus's engine starts smoking, and a major road gets shut down while passengers lunge for the emergency exits. Anti-Muslim attacks and mosque vandalism is up sixfold since the bombs went off on July 7. Young women I know who wear headscarves find themselves called "terrorist" when they walk down the street. Much of those jitters, I hope, will fade with time. It's what may get left behind that is most disturbing. The previously unknown shoot-to-kill policy for would-be suicide bombers, which when misapplied took the innocent life of a young Brazilian named Jean Charles de Menezes, deeply troubles and offends many Britons. But what is the alternative, if shooting a bomber means his bomb will go off? The stop-and-search policy, explicitly aimed at young men with dark skin, violates traditional British ideas of personal liberty, and would almost certainly be illegal in the United States. But what is the alternative, if random searches mean that scarce police resources are misused? ayatollahs who recruit young Brits into violent cults? Perhaps you see a pattern here: there is a telescoping of vision going on in Britain today. Great Britain has long valued its robust political debate, but now an eerie consensus has descended. Shortly after the July 7 bombs, Michael Howard (right), the lame duck leader of the Conservative Party, called for an investigation into possible intelligence failures that may have contributed to the bombing. I was never convinced such a probe was necessary, but it seemed worse to have Howard's idea shot down with whispered notions of national unity. What's remarkable is not so much that there is no opposition to the government, it's that the post-bombing atmosphere makes the opposition all the more impotent. Following 9/11, there were very few people in America who said that the attacks were a predictable result of U.S. foreign policy; the few who did make such an argument could not have believed that the offending policies—-unwavering billions for Israel, military occupation of Saudi Arabia, tacit (at least) support for Putin's bloodbath in Chechnya—-were going to change. Here, by contrast, there are plenty of prominent people who contend that the July bombings were a direct result of Britain's role in the Iraq war and occupation; I heard MP George Galloway (left) argue this point at length on Radio 4 this morning. But the end result is the same: it is impossible to imagine that in this climate, the bring-the-troops-home argument can gain political traction. We are simply obsessed with security, frozen by the idea of "not giving in". The atmosphere of denial, of forced unity, reminds me of Israel, or apartheid-era South Africa, with a depressing difference: in both those situations, there were huge portions of the population who supported the political goals of the violent opposition. In this instance, to the extent that Britain's bombers have any political goal at all, it would appear to be a complete overhaul of the Western state, to be replaced by Taliban-like Sharia law, and virtually no one in Britain wants that. So you see? There are no alternatives. The first of many nervous phone calls and text messages arrived at about 11am, some two hours after the bombs had done their worst. Initial rumours of a "power surge" on the underground had slowly been replaced with jittery reports of explosions everywhere – initially, four buses and seven tubes were alleged to have been struck. The destruction was eerily close as well. I was told, to my astonishment, that Edgware tube station – not more than a few hundred yards from where I live – had been blown up. I looked out the window – traffic of both pedestrians and vehicles on Edgware road seemed normal, with only the usual quota of sirens blaring in the background. No smoke issued from the site, and I hadn’t heard a sound. Yet the thought that further explosions were on their way imposed itself with immediate, compulsory force. Shortly after 12 noon, I knew things had gone back to normal, because the Prime Minister (left) had already been trying to make political capital from the bombings. He told reporters that: "It is particularly barbaric this has happened on a day when people are meeting to try to help the problems of poverty in Africa and the long term problems of climate change and the environment." As if it would have been less ‘barbaric’ if the bombers had waited for a week or two until the Prime Minister’s gloriole had been thoroughly spit-shined by Bono (left) and Bob Geldof (right). In fact, barely a correct note was struck by the government in its response. Muslims were encouraged to interrogate the behaviour of their neighbours, examine their own penumbral recesses, and root out what the Prime Minister would call "this evil ideology". Home Secretary Charles Clarke (right) darkly hinted on Channel Four news that "exceptional measures" may be needed, although he was suitably nebulous in describing what these measures might be. Tony Blair followed this with similar warnings and sophistical attempts to avoid the obvious – namely that these attacks were likely to be directly connected to the war on Iraq. George Galloway (left), Respect MP for Bethnal Green & Bow, popped his head above the parapet to state the obvious in parliament, and was described by Adam Ingram MP (right) as having "dipped his poisonous tongue in blood". Shortly thereafter, the Royal Institute for International Affairs, a centrist think-tank which receives funding from the Foreign Office, asserted that the attacks were indeed linked to Iraq. By this time, the disavowal was becoming embarrassing. Just as if you were to hear from a distraught friend that her husband (or lover, mother, son) had just been murdered while walking in a 'bad' neighbourhood, and were to respond by saying how upset you were to hear it (or maybe even to give that part a miss) but that it was extremely foolish of the deceased to have been walking there on his or her own. Indeed, this is exactly what I thought when I first heard that bodies were being rescued from smoke-filled tubes – how silly of me to live in such a dangerous area. The Guardian inadvertently provided the answer the following day, publishing a poll which showed that two-thirds of Britons believed that the Prime Minister’s war was co-responsible for the bombings. A few days later, a new poll showed that 85% of the public thought the same. MI5, ever vigilant, confirmed on its website that Iraq had been a "dominant cause" for the bombers. The wave of damp squibs that brought London very briefly to a standstill on July 21st was, as much as anything else, puzzling. Details flowed into work all day: nail bombs, fleeing suspects, fuzzy CCTV pictures, an "English man" spotted with a rucksack, a mosque surrounded by armed police (another bomb-scare), a bus with its windows shattered, UCH Hospital cordoned off because someone might be hiding in there, and a would-be bomber seen groaning with disbelief when paradise did not come. Forensic experts said that what was left was a goldmine of evidence. No one had been hurt. 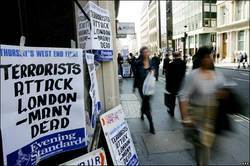 The following day, Evening Standard boards announced that a "bomber" had been shot dead on the tube. Metropolitan Police Commissioner Ian Blair (left) that evening said that the shooting was related to their ongoing anti-terror operation. What we now know, and should have known then, was that an innocent man named Jean Charles de Menezes (right) had been shot by members of SO19, an armed police unit. He was shot eight times, seven times in the head and once in the shoulder. The immediate response of the police was to tell a pack of lies. As a report in the Times later admitted, it was an unofficial police briefing that led reporters to believe that Mr Menezes had been followed from a residence in Stockwell to the tube station, challenged as he tried to buy a ticket, and – after he had vaulted over the ticket gates – chased down the escalator steps and shot before he could set off whatever device might have been on him. It was that briefing also which raised the red herring that Mr Menezes was wearing an unusually bulky coat. A BBC report said that the police had given chase after warning the man, then – having destroyed his brain "instantly, utterly" – did their best to resuscitate him. Like Humpty Dumpty, however, he would not be pieced back together. On the evening of Saturday 23rd, the police finally admitted that they had killed an innocent man. The only reason why the announcement, which could have been made within hours, was delayed until that time was presumably in order to reduce and delay the reaction. The excuses were ready. The man had been acting suspiciously. The officers involved were trying to save lives – indeed, by rushing toward what they thought might be a suicide bomber instead of away, they had acted heroically. Lord Stevens, former Metropolitan Police Commissioner (left), wrote in the News of the World tabloid the next day that he felt sorry for the officer involved. He said that it had been necessary to kill, and that this had been a terrible lesson learned in Israel and Sri Lanka, where British officers had been trained in how to handle suicide bombers. The brain, he said, must be "destroyed instantly, utterly". These procedures have been formalised under Operation Kratos, and are recommended by the International Association of Chiefs of Police, whose reports helpfully note that it is not necessary for a perceived threat to be imminent for an officer to shoot. True: under British law, a police officer need only demonstrate that he believed there to be a sufficient threat to justify a fatal intervention. In the days that followed, detail after detail emerged which challenged the police’s story. He was not followed from Stockwell, but from Tulse Hill, where he emerged from a block of flats that intelligence officers were watching. It was not clear which flat he had emerged from, or even which one they were supposed to be looking for. He was allowed to board a bus, and managed to sit through a whole journey without killing anyone. It is still not even clear whether the police ever identified themselves. A number of eyewitnesses say that they did not, and guidelines under Operation Kratos state that officers need not identify themselves to a suspected suicide bomber, as this may trigger detonation. The family of Mr Menezes announced that they had been told by police that he had not been wearing a bulky jacket, but his usual denim affair which would not have been out of place when the highest temperature was 17C. Nor had he leapt over the ticket barrier. He had used his travel card to walk through, crossed the concourse and descended the escalator stairs. It is not clear at what point he started to run. The family said he may well have been running to catch the train as he heard it arrive – indeed, a train had just arrived at that point. CCTV footage, examined by the Independent Police Complaints Commission, confirmed everything the family had said. The police never bothered to corroborate the Menezes family: instead, they leaked pictures of the after-effects of the 7/7 bombings to ABC News and sent the officer involved on a paid holiday with his family, courtesy of the Metropolitan Police. One other detail. At a vigil for Mr Menezes outside Stockwell station, I heard a tube driver and a member of the RMT union describe how the tube driver on that day had a gun pointed at his head by one of the officers involved. Like the passengers, he was fleeing the scene. Unless tube drivers are now among potential terror suspects, this suggests that the men with guns were totally out of control, psyched up and ready to pull the trigger at the merest provocation. And this may not have been an isolated incident: Ian Blair told Channel 4 news that there had been 200 incidents in which armed police had been pursuing suspects, and at least seven in which the officers were "as close as that" to killing the suspect. "According to Home Office statistics, 97% of those arrested under the Prevention of Terrorism Act - a series of draconian measures supposed to thwart the IRA - between 1974 and 1988 were released without charge. Only 1% were convicted and imprisoned … More than 700 people have been arrested under the Terrorism Act since September 11, but half have been released without charge and only 17 convicted. Only three of the convictions relate to allegations of extremism related to militant Islamic groups." The draconian curbs on political and intellectual freedom derive from the Prime Minister’s specious insistence that the cause of terrorism is a "perverted ideology" that can be "rooted out". One Muslim student at the London School of Economics, Nasser Amin, has already been subjected to a smear campaign for writing an article in which he defended the right of Palestinians to use violence, a position shared by leading philosophers like Ted Honderich (left). Under new laws, he could face imprisonment – exactly what one MP recommended while dragging Amin’s name through the mud in parliament. Grim as this must seem, Muslims are much more self-confident and politically expressive than they have been for years. Radical, young organisations like MPAC challenge the entrenched Muslim hierarchy. 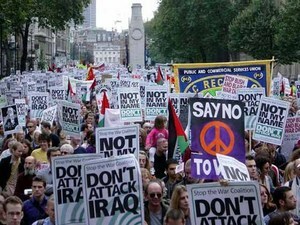 And the Stop the War Coalition, which has won considerable standing in British politics (at left, part of a giant London Stop the War demo), is mounting a renewed campaign to defend civil liberties, support Muslim communities and withdraw troops from Iraq. On Thursday 04th August, it held a packed conference to launch the campaign. Flag-waving is nowhere to be seen, and scepticism of the government is pervasive. The next national demonstration against the occupation of Iraq and in defence of civil liberties is to take place on September 24th. In addition to state violence, Muslims have to worry about growing racism. Mosques have been subject to arson attacks, there have been several racist beatings and at least one racist murder of a Muslim man. The number of ‘faith hate crimes’ shot up by 566% according to police figures. On Friday 15th July, a Muslim bookshop in Leeds was raided by police and a cache of ‘subversive’ material seized – it transpired that what was seized was antiwar material, including Stop the War Coalition leaflets, and books by campaigning journalist John Pilger. On Friday, 5th August, the Prime Minister finally unveiled those darkly adumbrated "exceptional measures". There is to be an offence created under new ‘anti-terrorism’ legislation of "condoning or glorifying terrorism", while grounds for deportation or imprisonment include "fostering hatred, advocating violence to further a person's beliefs or justifying or validating such violence". These terms are deliberately broad, and their interpretation is to be under the discretion of the Home Secretary. The reactionary Islamist party Hizb ut-Tahrir was banned, despite the fact that the party has not been accused of involvement in terrorism. Blair is also reported to be interested in extending the length of time a British national can be detained without trial to three months. "The rules of the game," the Prime Minister intoned, "have changed". 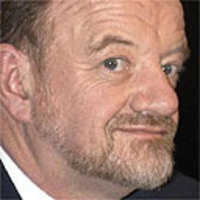 BRIT ANTI-WAR FIGURE ROBIN COOK, FORMER FOREIGN MINISTER, DIES The man who resigned as the U.K.'s Foreign Minister to protest the Anglo-American invasion of Iraq, Robin Cook, died yesterday unexpectedly while mountain-climbing -- he was only 59. The Guardian has a package on Cook, in which it is noted that, after his resignation speech on Iraq, "Number 10 had to fear his next excoriating analysis of where Tony Blair had gone wrong." You can read the full text of Cook's historic resignation speech opposing the Iraq war by clicking here. And on Lenin's Tomb you'll also find an accurate enough comment about what Cook's passing means for the future of the opposition within the Labour Party to Blair and Blairism. » April Fools, folks! from the Mozilla Foundation. The Neo-Conservative War of Terror and Our Conformist "Liberals"
These days I'm beginning to believe that America's establishment liberals are in fact suffering from a case of Mad Cow Disease that has really softened their brains. Why else would anyone in their right mind be buying, in any shape or form, into the neo-conservative "War on Terror" (i.e. War of Terror) or even consider the issue of so-called terrorism on a par with other consequential world crises, such as the disaster of the global warming phenomenon or the Iraq war? Is the issue of terrorism, even as defined by the neo-conservatives in the US government, anywhere as significant? I know this raises a few eyebrows, but the discussion becomes somewhat clearer when we consider the following question. For the sake of the argument, we will assume, for the moment, that the Bush administration's claims regarding Al-Qaeda's existence and activities are true and correct. I ask you: "Who has done more damage to the fabric of life in America? Is it Al-Qaeda or Enron? Was it al-Zargawi or the Vietnam War that brought about the deaths of more than 50,000 US servicemen? Would it be Osama bin-Laden or the Savings-and-Loans thievery that brought misery and hardship to millions of Americans?" I urge you to honestly ask yourselves these questions. I think to most of us (other than, perhaps some with extremely softened gray matter), the answer is quite clear. Even if we accept the official figures at face value, far more people are hurt or die of other causes than terrorism. For example, based on CIA's own figures and the UN data, from 1968 to 2003, worldwide deaths from terrorism were 1.25 per day (CIA) while starvation caused the deaths of 23,468 people (UN) each day. *3* Compared to other ravages, such as cancer, heart attack, or AIDS, damages resulting from terrorism (as defined by governments) are even more miniscule and insignificant (especially in the Western world). Why are we pouring trillions of dollars into the pockets of Halliburtons, Bechtels, when we should be spending money into the fight against corporate terrorism. I can perfectly understand the neo-conservatives trying to inflate the issue of "terrorism" every second of the day because their very existence is tied to it. After all, the "War on Terror" has done a terrific job of lining up the pockets of their corporations (Halliburtons, Bechtels, ...) and put into motion the wheels of their "Project for the New American Century" (newamericancentury.org). America's culture of fear has also aided the neo-conservatives maintain their base of support to some degree. Secondly, let's look at George Bush's bogeyman, the mythical Al-Qaeda and its worldwide web of intrigue. Those who have followed guerrilla organizations around the world can tell you these groups have some solid and generally-known characteristics that follow some earthly pattern and logic. For example, they operate within a known location. FARC guerrillas, for instance, operate in parts of Colombia. They might occasionally venture into Venezuela, but you should start asking questions if someone claims they operate in Canada or even Chile. Even the most inept intelligence agencies generally have a good estimate of the number of guerrillas integrated into these organizations. The extent of their activity is mostly known. Their organizational hierarchy and methods of communication are understood. To give you another example, it is generally known that Hezbollah operates in Lebanon. They have bases, armories, and guerrillas; they operate schools, mosques, and hospitals. Again, even the most inept intelligence agencies of the region have a fairly good estimate of its size. The extent of Hezbollah's activities are more or less predictable. No major surprises. If someone then tells you Hezbollah owns nuclear weapons, you don't have to be a genius to understand they are trying to make a fool out of you. Another example: the Irish Republican Army operated in Northern Ireland and London. Again, if someone tried to pin an explosion in Buenos Aires, Argentina on the IRA, one should be somewhat of a simpleton to, at least, not ask why. Does anyone ever ask why any Arab guerrillas should be placing bombs in Spain (of all the places in the world), a country that has always celebrated its past Moorish culture and architecture, whose people have been the closest to the people of the Middle East in terms of sentiments and sympathies? Guerrilla organizations use earthly mechanisms for communication: newspapers, telephone, messengers, etc. The extent of the activity of these organizations generally does not go beyond the neighboring country or countries. For example, Kurdish peshmarge (of the PKK) have been known to have used border areas of the Iraqi territory to launch attacks against the Turkish army. And these are organizations that have extensive grassroots organization and a popular base of support (and therefore, the means). What is the size of Al-Qaeda in terms of number of guerrillas? How do they raise funds for their activities? The Afghan Mujahedeen (that the Taliban and Al-Qaeda would be remnants of) were only significant because of the flow of CIA and Saudi funds and arms and the active assistance of the Pakistani intelligence. Once that support was withdrawn, all that was left was a bunch of Madrasas (religious schools) and insignificant militias, such as today's Taliban. In some ways, it could be claimed these forces, today, are as insignificant as America's right-wing militias (from the global point of view), unless they are being kept alive and used by the United States and its allies. The US claims Al-Qaeda forces operate all the way from Southeast Asia to Africa, Europe, and the United States. Wow, this Al-Qaeda must be truly an amazing organization - even more potent than the CIA and the entire US intelligence apparatus with its billions and billions of dollars of budget. Isn't that something? It is truly stupefying because once a lie is repeated enough times, even the liar himself begins to believe the lie. You would be surprised how many bean-counters in the FBI, the CIA, and the Pentagon would actually believe their own lies. Without September 11 attacks, George W Bush would have had no chance in hell to invade Afghanistan and Iraq. The American people would never have bought into those wars. Following in George Bush's footsteps, Jose Maria Aznar, wrongfully thought he could publicly justify Spain's presence in Iraq and arouse the Spanish people's jingoistic sentiments. It turned out, to Aznar's misfortune that Spaniards were not so gullible. When September 11 attacks occurred, some tried to warn us all that these attacks were "Hitler's Reichstag Fire", but we didn't have the press at our disposal, and we didn't want to believe the worst. The corporate media maintained a wall of silence. And while a good section of the left preferred to deal in generalities*9*, the Bush administration managed to ride upon popular confusion and fear and convince some of the population to allow it to complete his corporate coup and legalize the administration's hideous Patriot Act. Today, there are rumors that the Bush administration is making preparations for an invasion of Iran after another 9/11 attack on the US soil, and the complicit corporate media will be all the way behind him. They are already laying the groundwork for that with this nuclear nonsense, and our "liberals" are once again being suckered into yet another undesirable position. Up until recently, the most crooked of our politicians gained advantage and advanced themselves at the expense of the more vulnerable sectors of the society (i.e. the African Americans and other minorities) by declaring their crusades against crime. As the governor of the State of Texas, George W. Bush was one of these politicians, having sent the largest number of prisoners to their death. The phony war against crime and criminals is today replaced by yet another phony crusade: the "War on Terror". The victims continue to be from the most oppressed communities around the world. It would be a crying shame for anyone with a minimum of integrity to buy into this crusade under any pretext. PS: You must stop the next 9/11 on US soil by stopping the Bush regime and his media collaborators. *2* When US citizens can be arrested and kept in custody indefinitely without trial (because the US government knows it has nothing to prove in a court of law), you should know that you have lost all your liberties (the case of Jose Padilla). *4* Yahoo.com hosted slideshows of (official) 9/11 clips online, for close to three years after 9/11. Democratic charlatans (Lieberman, Feinstein, Kerry...) have also been champions of the so-called "War on Terror", sometimes more ardently than the neo-cons themselves. *5* After Sept. 11, the use of security systems and equipment proliferated in corporate America as well as our government agencies. From issuing employee badges, to the use of biometrics, badge readers, monitoring devices, the policies of fear and paranoia cost the very same corporations (and American taxpayers) billions of dollars. The deployment of security software to encrypt email messages and authenticate communication required more resources and more powerful computers. These were just a tiny fraction of the hidden costs of George Bush's war of terror. "An organized, often officially encouraged massacre or persecution of a minority group, especially one conducted against Jews." I think what lenin wrote above already answered the objections later offered by Mark: this particular group of police officers was out of control---they simply did not have enough evidence for such drastic action. There has to be a ``reasonable person'' test here, and they flunked it. Charges against them of voluntary manslaughter would seem to be appropriate, so far as I am concerned, but IANAL, and also there is the worry that they might not act fast enough when it was actually necessary in some later case if they feared felony prosecution. Still, the police have the legal power to use violence against the people, and they get away with using it on too many occasions when they should not have used force at all. "The trouble is, there was absolutely *nothing* in Mr Menezes' behaviour, background or profile to indicate that he might be a suicide bomber." How do you know there was *nothing* suspicious about his behavior? At some point we do know Menezes ran off from armed police. That will have sparked huge suspicion, obviously. (In hidesight we know this may have been because he was an illegal immigrant). You then go on to point out the surveillance team originally tracked him out of a flat they where watching in connection with the previous days attempted attacks, and then notified the armed police units; obviously then, you already know this was a case of mistaken identity and have answered your own question. Remember, this all came 17 hours after 4 people attempted to blow up the tube again - something that happened two weeks after a successful attack. Try and look at it for a second from the police's point of view. They were/are dealing with unprecedented circumstances under huge pressure. This stuff about racism is a complete nonsense.